Lloyd is a regular kid, except for the fact that he is an alien. He deals with typical problems, and always learns a lesson. 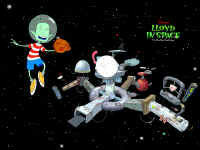 Lloyd and his three friends, Eddie, Douglas, and Kurt, live in space and try to have fun together, and they always are taught a lesson in the end. Lloyd P. Nebulon is an average teenage boy 13-year old of the Verdigrean species. He frequently uses the word "junk". Lloyd is voiced by Courtland Mead. Edward J. "Eddie" Hortonis a 14-year old is Lloyd's human friend who has red, wavy hair. He acts in a very "cool" manner. His father is a police officer. Eddie tends to think himself as the ladies' man. Eddie is voiced by Justin Shenkarow. 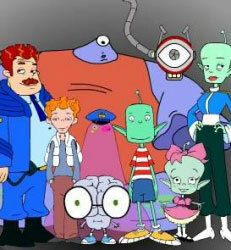 Kurt Blobberts is a 14-year old is Lloyd's large, purple, one-eyed friend. While sometimes slow on the uptake, Kurt is a gentle and kind boy.His head can be removed from his body and still function. Kurt is voiced by Bill Fagerbakke. Douglas McNoggin is a 11-year old resembles a brain with glasses, arms, and legs. One of Lloyd's friends. While he is the most intelligent character in the show, he is also the least athletic. Douglas is Voiced by Pamela Hayden. Station is the space station's computer. When activated, he assumes the form of an eyeball attached to a long wire leading from any computer terminal. Station has a tendency to be fairly neurotic and oblivious to those around him. Brittany Boviac is a snobby girl at school who is captain of the cheerleader squad. She is also revealed later in the series to have a secret crush on Lloyd. Although she secretly likes Lloyd, she publicly insults him, giving the impression that he is not worthy of her time. She is voiced by Anndi McAfee. Kurtlas is the fusion between Douglas and Kurt due to Lloyds suggestion. At first Kurtlas defends the nerds from bullies but all this fame goes to his head and decides to become the school bully himself. He is stopped by Lloyd. The Preditalien is a monster which attacks and infects Intrepidville from the year X27 to X37. If one scratched or bit another life form they too would become monsters. 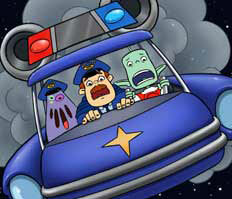 In the episode the preditalien appears it is merely an illusion created by Francine to Scare Lloyd and his friends. Dunkirque is the second-in-command of the space station. He is a tough and obedient aide to Commander Nebulon. Dunkirque is voiced by Dan Castellaneta. Larry is another one of Commander Nebulon's aides. He is a purple humanoid who frequently acts childishly. Voiced by Eddie Deezen. Boomer is the mechanic who repairs all the spacecrafts on Intrepidville. He is fairly simple-minded. It is revealed in "Boomer's Secret Life" that he is the heir to his race's throne, but he turned his title over to his brother Sleeveknot. Boomer is voiced by Diedrich Bader. Lou 2000 is Station's bad-mouthed backup system. When in use, he frequently picks on Larry. Lou is voiced by John DiMaggio. Commander Norah Li Nebulon is the commander of Intrepidville and Lloyd's single mother. Nora's husband never appeared in the series. She is voiced by April Winchell. Francine Nebulon is Lloyd's younger sister 5-6 year old. Gifted with the powers of telepathy and telekinesis, she uses her psychic powers to pick on Lloyd and make his life miserable whenever she possibly can. Her mental telekinetic gift has the power to levitate objects. Whenever Francine is reading someone's mind (particularly her brother's), her forehead lights up. Megan is Brittany's best friend. She is usually with her wherever she goes. Most of the time she is slightly meaner than Brittany. Mr Stinko is a garbage man on Intrepidville. Voiced by Kevin Michael Richardson. 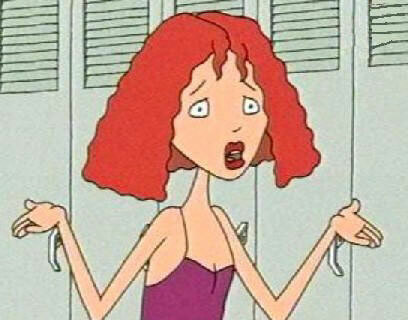 Cindy is the two-headed girl that Lloyd takes to the dance. While one of her heads is usually polite and well-mannered, the other tends to be rude and abusive. Her Nice head is voiced by Tara Strong. Rodney is the school bully who loves to pick on Nerds, particularly Mendel. Mendel is one of the nerds at Luna Vista and is the main target of Rodney's bullying.